This post is a part of the Reptile and Amphibian Blogging Network’s (RAmBlN) #HerpsAdapt event in honor of Darwin Day. RAmBlN is showcasing the remarkable evolutionary abilities of reptiles and amphibians by posting 1-2 blog posts per day 12-16 February. See the full list of posts on our website and follow us on Facebook and Twitter for updates. Au contraire, indeed they are, as are many lizards (together termed squamates) and their social behavior is more like birds and mammals than many guess! We are just starting to learn about snake sociality, but the lizard behaviorists, and Aussies in particular, are way ahead of us. Here are just a few especially cool examples of complex social behavior in the Egernia lizards native to Australia. 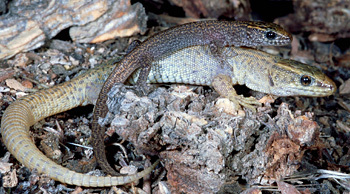 Great desert skinks cooperatively build large, elaborate burrows for their families (see this article for a summary or read the full article here). There’s a fun video of these social lizards interacting here. Sleepy lizards (AKA shinglebacks) are monogamous, beautifully described in this clip from Life in Cold Blood (highly recommended) and in this paper by C. Michael Bull. WARNING: this video is a tearjerker. White’s skinks live in small, stable family groups, usually consisting of an adult male, adult female, and their kids. Lots of great research on these little cuties, including this, this, and this. So is this behavior limited to Egernia lizards? Nope. Desert night lizards (native to the western US) also form small, stable groups and juveniles are often found in groups with one or both of their parents and siblings (read the full article here). Now let’s talk snakes. Timber rattlesnakes exhibit many of the same traits we’ve observed in Arizona black rattlesnakes: they den in groups and use communal nest sites. At these sites, pregnant females and juveniles preferentially aggregate with relatives. Timber rattlesnakes can recognize their relatives and are more likely to select hunting sites where other rattlesnakes were successful. For our study of social behavior in Arizona black rattlesnakes, we used frequent, repeated observations on groups to examine association patterns and describe their social structure. From early April through mid-May, we set up remote timelapse cameras to record semi-continuous behavioral observations. Then we applied two techniques novel to behavior research of snakes to analyze observations: association indices and social network analysis (see this paper for an example of these techniques used to describe fish social behavior). Priscilla (left) and MolMan (right), the larger snakes pictured here, are friends; they spent nearly half their time on the surface together. Association indices estimate the proportion of time each pair of rattlesnakes spends together, permitting comparison of relationship strength among pairs within a population and allowing us to distinguish between random and non-random associations. Additionally, association indices can be used to construct weighted social networks. Rattlesnakes in our population did not associate randomly; they have friends (pairs of rattlesnakes observed together more often expected by chance) and individuals they appear to avoid. Adults were more likely to be friends with other adults, or with juveniles, than juveniles were to be friends with each other. In fact, juveniles were most likely to never have been observed together at all. A social network is a graphical representation of a group’s social structure. We used association indices to construct a weighted, undirected social network for two rattlesnake communities within the population we studied (there were zero associations between individuals from different communities) and delineated those communities into subgroups which contained individuals who associated more with each other than with members of other subgroups. In this social network graph, associations are represented by lines between nodes (individuals), weighted so that stronger associations are heavier lines. Node color indicates to which of the three subgroups that individual belongs and node shape and size depicts individual attributes: shape indicates age (circles = adults; squares = juveniles) and size indicates association strength. Three rattlesnakes were never observed with other snakes, so they do not belong to a subgroup and are not connected to anyone else in the network. Timelapse cameras aren’t perfect and sometimes it is difficult to identify every individual pictured. So we’re now adding observations we made when visiting the sites and using photographs and field notes to clarify the timelapse data. The results presented here aren’t final, and we’ll post an update once they’re ready for publication. Bull, CM. 2000. Monogamy in lizards. Behavioural Processes 51:7-20. Chapple, D. G. and Scott Keogh, J. 2006. Group structure and stability in social aggregations of white’s skink, Egernia whitii. Ethology 112:247-257. Clark, R. W. 2005. Social lives of rattlesnakes. Natural History, March 2005 Issue. Clark RW, Brown WS, Stechert R, Greene HW. 2012. 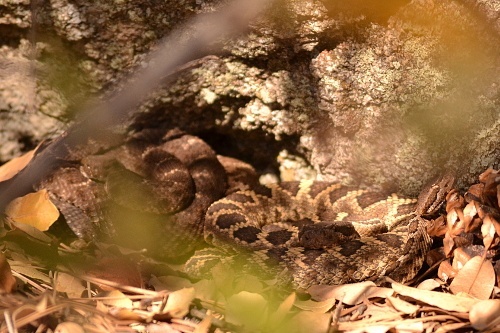 Cryptic sociality in rattlesnakes (Crotalus horridus) detected by kinship analysis. Biology Letters 8:523-525. Clark, RW. 2007. Public information for solitary foragers: timber rattlesnakes use conspecific chemical cues to select ambush sites. Behavioral Ecology 18:487-480. Clark, RW. 2004. Kin recognition in rattlesnakes. Proceeding of the Royal Society of London Series B Biology Letters 271, S243–S245. Kelley JL, Morrell LJ, Inskip C, Krause J, Croft DP. 2011. 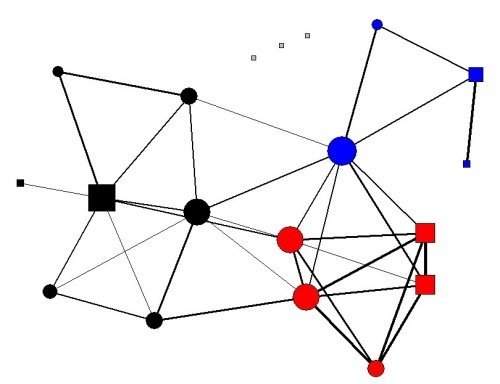 Predation risk shapes social networks in fission-fusion populations. PLoS ONE 6:e24280. While, GM, Uller, T, and Wapstra, E. 2011. Variation in social organization influences the opportunity for sexual selection in a social lizard. Molecular Ecology 20:844-852. While, GM, Uller, T, and Wapstra, E. 2009. 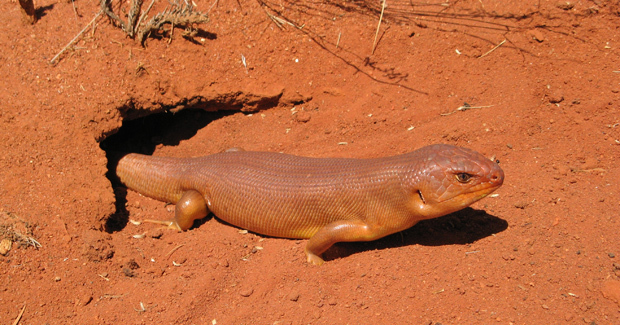 Within-population variation in social strategies characterize the social and mating system of an australian lizard, Egernia whitii. Austral Ecology 34:938-949.